Southport is home to the UK's highest concentration of championship links courses - it is perfect for a golfing holiday, no matter what your handicap is! Royal Birkdale Golf Club, the prestigious course, is the jewel in the crown of Southport's golfing heritage and is widely regarded as the best links course in England is is a regular host to The Open Championship. But Southport's reputation for being England's Golfing Capital is not just based on Royal Birkdale. It boasts more championship courses within 15 minutes drive of the town centre and another only half an hour away, which is why it earns this name. Southport is an ideal base to explore the golf coast, including Royal Liverpool Golf Club and Royal Lytham & St Annes - these are some of the best courses in the world. Leave the hustle and bustle of the city behind, relax and enjoy some of the best golf links in the world - why try anywhere else? Hillside Golf Club which is neighboured by Royal Birkdale is set within sand hills and has a challenging layout with a back nine that lingers long in the memory. Hillside is host this year to the British Masters hosted by Tommy Fleetwood. Hesketh Golf Club is the oldest course in Southport, established in 1885. Predominately links in nature, Hesketh provides a varied and interesting mix of holes. Southport & Ainsdale Golf Club is a true championship links course set amongst the dunes. This former Ryder Cup venue is another of James Braid's great creations. 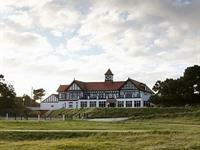 Formby Golf Club & Formby Ladies Golf Club are set on a site of special scientific interest. The mix of traditional links and stunning terrain make for an unforgettable golfing experience. West Lancashire Golf Club - Blundellsands. Founded in 1873 and among the 10 oldest clubs in England, West Lanc is one of the most natural and testing links in the British Isles. Formby Hall Golf Spa & Resort - situated on the outskirts of Southport and just 13 miles from Liverpool. When you are not on the course, there are plenty of things to keep you busy in Southport. 22 miles of coastline to explore, shopping or relaxing in one of the huge choice of restaurants. Aotearoa Southport offer secure gated parking, a relaxed family run establishment after your day on the course and plenty of information and assistance in relation to golf holidays, restaurants to eat and drink in etc etc. Why not relax in the sunshine with a complimentary glass of wine or a beer which all direct website bookings attract. What are you waiting for?